British author Sabbagh (A Rum Affair, 2000, etc.) looks at a major unsolved problem in pure math and the men working to solve it. 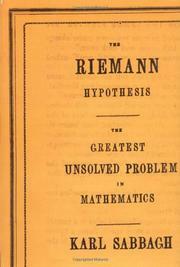 In 1859, the German mathematician Bernard Riemann stated his solution to the problem, which concerns the distribution of prime numbers in the natural number system. He could not provide a proof, but thought his answer “very probably true.” Since then, the sharpest minds in math have wrestled with it—so far, without a proof. But its importance is such that experts believe that a definitive answer would instantly settle a hundred other unsolved problems that assume its truth as a starting point. The author uses the problem as an opportunity to profile some two dozen Riemann specialists. The result is a surprisingly warm portrait that focuses as much on these men’s passion for mathematics and their reasons for becoming mathematicians as on the hypothesis itself. The central figure in this account is Purdue University’s Louis de Branges, who may be on the verge of proving the Riemann hypothesis. But most of his peers doubt his claim, even though de Branges solved another difficult problem, the Beiderback conjecture, several years ago. Sabbagh provides a good look at the culture of world-class mathematicians: their rituals and their jokes, their politics and their shortcomings (many are only mediocre at day-to-day calculation). “Toolkits” appended to the text offer brief refreshers in the key mathematical concepts (equations, graphs, matrices, etc.) that the subjects here use. Even so, the problem remains unsolved unless the experts accept de Branges’s proof, which is given in outline in an appendix. As the author admits, most readers will end up with no better idea of the dimensions of Riemann’s problem than before they started, but Sabbagh’s picture of the mathematicians’ world should amply compensate for that. A fine piece of scientific sociology.